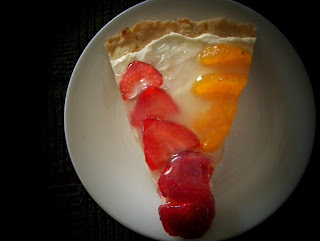 Post #45 featured a mini-fruit pizza made with an orange-flavored sugar cookie crust and rum flavoring in the sweetened cream cheese layer. I loved the recipe, but it was not the fruit pizza I had in mind. I wanted a dessert with a crisp, tasty crust, a flavored cream-cheese layer and glaze for the fruit on top. I also only wanted to use the fruit I had on hand - some very ripe strawberries - and a can of mandarin oranges. The recipe I developed met all my requirements. The crust is like a crisp shortbread and the orange peel adds an amazing aftertaste. To cut back on the sugars, the cream cheese was sweetened with Splenda. 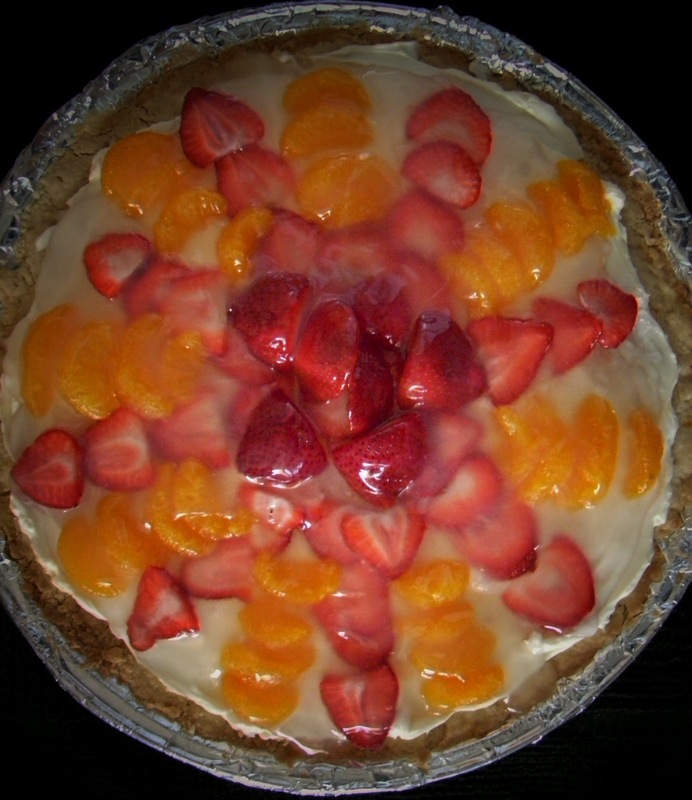 Orange extract was added to the cream cheese to enhance the orange peel flavors in the crust. While the lemon glaze is optional, it not only added to the overall appearance, but the lemon flavor was an unexpected flavor treat. Combine flour and sugar in a bowl. Cut in butter and mix with a fork until crumbly. Put in microwave for 30 seconds. Add orange rind. Mix well. Line a 12-inch pizza pan with foil. ( I used foil because my pizza pan is perforated). Press mixture evenly onto lined pan. Bake 350 degrees for 10 minutes or until lightly browned. Cool pan with crust on wire rack. Combine cream cheese, Splenda and extract in a bowl until well blended. Spread over cooled crust to within 1/2 inch of the crust edge. Optional: blueberries, fresh pineapple, kiwi, raspberries, etc. Arrange fruit in a pattern of your choice. Combine cornstarch, sugar, salt and cool water in a saucepan. Stir until smooth. Add hot water and cook over med. heat until thick...stir continuously. Lower heat and simmer for 4 minutes. Add lemon juice and cook for 1 more minute, while stirring. Place saucepan in ice water, stirring until glaze is cool and smooth. Drizzle glaze over fruit and exposed cream cheese layer; spread gently with a spoon until pizza is coated well. There will be some glaze left over. Refrigerate until ready to serve. Slice into wedges. Marian wrote: The fruit pizza is beautiful. You have such good ideas for presentation! Kenda wrote: Did I tell you how tickled I am to have your fruit pizza recipe? We’re having a family BBQ here Memorial Day weekend, and I am going to make it for everyone.